~ "It takes time and money to waste time and money." Now that you are well planted in your chair, allow me to potter along with a little story of Aldgate that I have meant to put into this lettered form for far too long. When I left off the eighteen-hundred year history of that edifice the year was 1761, and I clumsily ended saying that it was briefly being reconstructed at Bethnal Green as a curiosity. I had a sneaking feeling that something was wrong here; this was the only mention that I had found of it being reconstructed, and there was no evident reason for why this would have happened. The story that I found, however, was beyond what I had expected – and stretches the history well into the 19th century. To begin, we must go back to 1761, when the order for the gate to be dismantled was first given. The structure that was being pulled down dated from 1607, but may well have contained much recycled material from the earlier medieval structure. This is where I have to introduce a magnificent antiquary – Ebenezer Mussel esq. – a Fellow of the Royal Society of Antiquaries and renowned collector of a vast range of ancient objects. From Roman and Egyptian treasures to illuminated manuscripts and even a pair of Elizabeth I’s gloves, this man’s vast collection covered the history of much of the globe, and his interest seems no less disposed towards the poor fate of the ancient gates of London. So, naturally, he bought one. 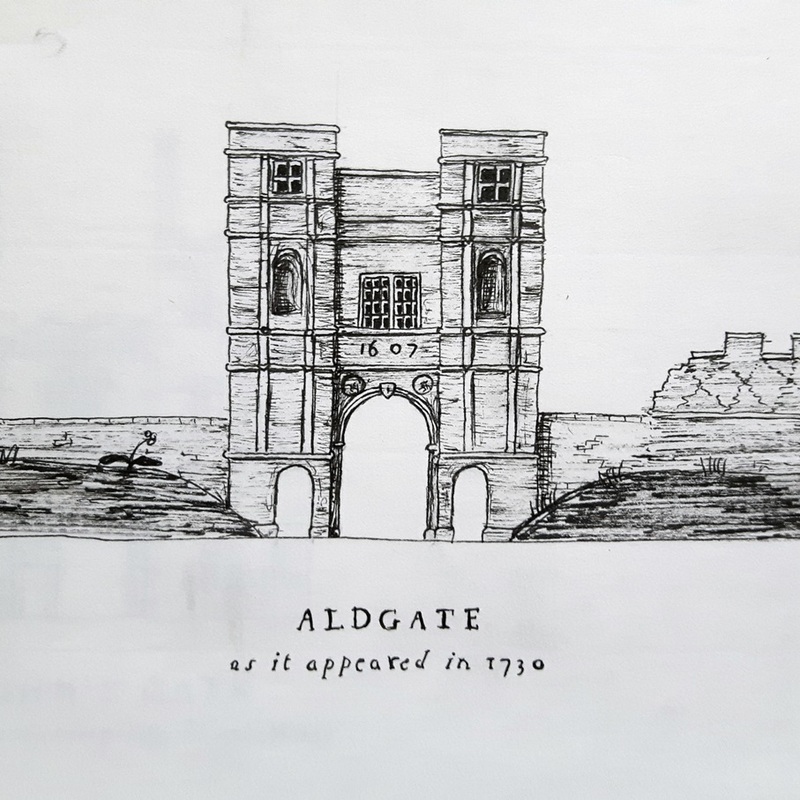 This gate was, as the Reader may be happy to expect, Aldgate – and he had all of the materials of the gate used to construct a wing on his home known as Corner House in Bethnal Green. It is this that led to it becoming known thereafter as Aldgate house. Corner House itself is recorded as early as 1538, and had already been rebuilt in the early 1640s and possibly again during the reign of James II, Mussel had bought it in 1760, only a year before purchasing Aldgate. Mussel sadly died without seeing the new ‘Aldgate wing’ finished, but his son Ebenezer Mussel jr. had it finished in 1766 and had an inscription made up to celebrate it. The wing stood on the north side of the house; incorporated into the gate were the ancient battlements, the pair of circular portraits of Roman emperors, supposedly based on coins from a hoard discovered when Aldgate was being rebuilt in 1607. The arched relief under the window may have been the wooden relief cut from ‘Wat Tyler’s Tree’ – a tree on Bow Common that had been cut down some years earlier, and local legend said had been the tree under which Wat Tyler had met his rebellious peasants. 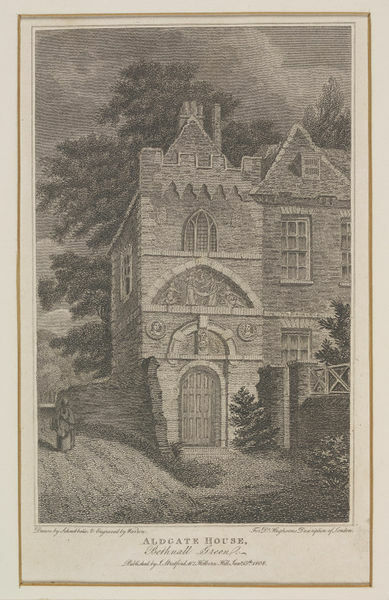 A slightly later engraving of the house. After Ebenezer Mussel snr.’s death at the start of October 1764 the house and Ebenezer’s possessions’ ownership came into question, and it took two law cases for things to be settled, during which time the house was rented to a few of the many Jewish families who were at that point moving into Bethnal Green. The collections in the house were sold off in 1765, and the library followed in 1782. In 1790 the house was finally confirmed as having passed to his wife, Sarah, who had remarried in May 1765 to one John Gretton. Sarah, however, had died before 1790 so the house went to her widowed husband. As a side note completely outside of the gate, and just to spark a bit of 18th century gossip, Sarah and John’s first daughter was born only three months after their marriage, and their marriage itself was only seven months after Ebenezer’s death. 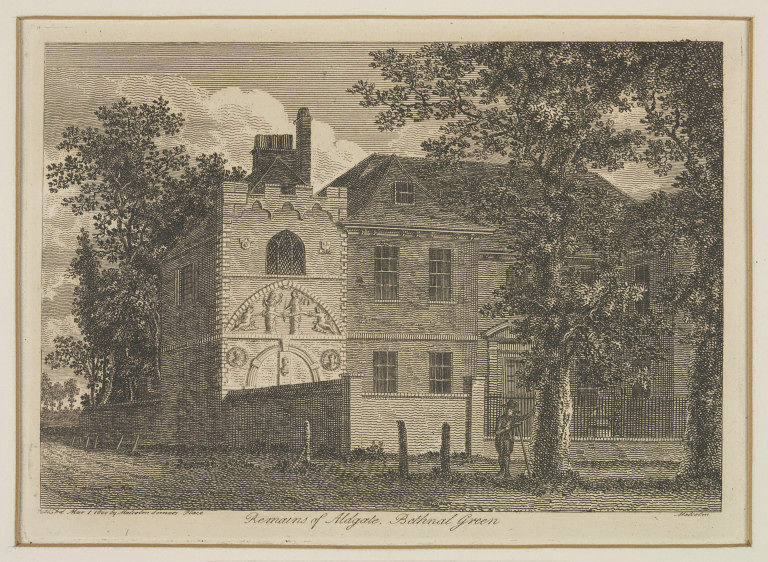 Hughson describes the house as still standing in his description of London published in 1807, but it can’t have been long after this that Gretton had the aging property pulled down and replaced with a few houses and a small Calvinist church, which he touchingly named the Ebenezer Chapel. The chapel was finished in 1811, and the entire development by 1813. It is unclear how long this stood for, but by the end of the 19th century the population demographic seems to have shifted enough that there was little need for an independent chapel in the middle of Bethnal Green. By the start of the 20th century it had been replaced by Our Lady of the Assumption Roman Catholic Church, which still stands on the site today.